Tizzard, who admitted that things haven't been easy for the stable lately, said: "He's just a dream horse. I've always felt that after the Cue Cards, Native Rivers and Thistlecracks, where am I going to find another one. I think we've seen him today and it's lovely isn't it. It was like poetry, wasn't it. "This game has never been easy. We have had some wonderful times in recent years with these good horses but if we can't have a bad month there is something wrong somewhere along the line. There are always issues but lovely horses like Lostintranslation make it worthwhile. "You would think he will be a flagbearer next season. He stays, jumps and travels. He has got everything and is a beautiful, big, strong boy as well. He is a lovely creature." He added: "We'll obviously be going down the Gold Cup route as he's a very good staying chaser with everything in front of him. We won't run him again this year as we've done plenty with him." Explaining the more patient ride, he said: "I don't usually get involved in the tactics, but we had a word with Robbie (Power) and changed the tactics. Because he's such a good jumper he's been getting to the front and then getting picked off by pacier horses. We wanted to save his pace for the end, for Topofthegame, thinking we might beat him for pace. That's absolutely lovely." 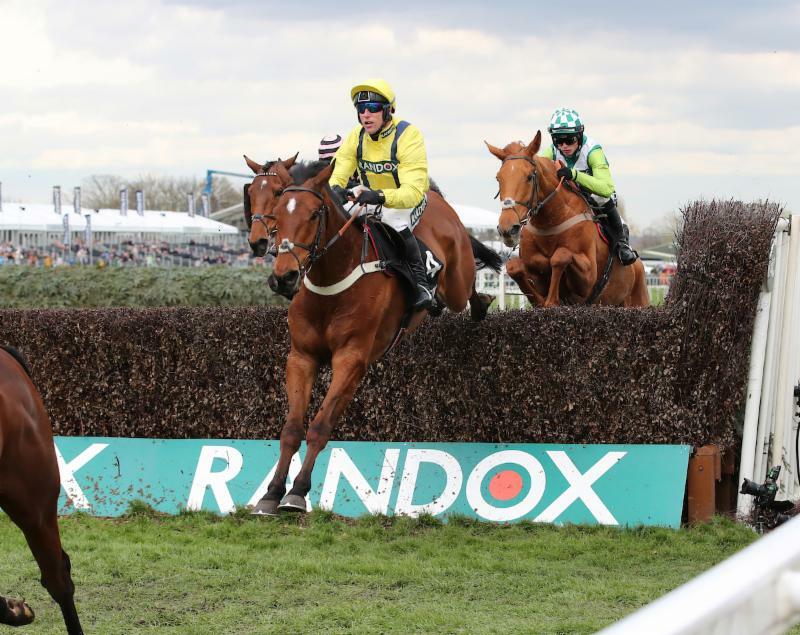 Lostintranslation is an 8/1 chance for December's King George VI Chase with Betway, the official betting partner of the Randox Health Grand National Festival. Joe Tizzard, son and assistant trainer, added: "We were waiting to step Lostinstranslation up in trip - we didn't want to do it at Cheltenham - but he is a different horse. We have looked forward to this horse for quite some time and he ran a blinder at Cheltenham, when he just got beaten by a very good horse. "Today, he was impressive and he deserved it - he has been a good horse for a long time and he is our sort of future. We have had a quiet sort of spell for a month and that was quite a big one. "Dad absolutely loves the horse. Lostinstranslation was about to do a performance like that and you need a bit of luck but I didn't think it was going to be quite as smooth as he has done it today. This horse is our future and we have loved him for a long time. "I gave myself a second to watch Robbie pulling him up as well. He isn't that animated very often but he likes this horse, he has liked him a lot and he is a smart." Robbie Power steered 3/1 shot Lostintranslation to an impressive victory in the £100,000 G1 Betway Mildmay Novices' Chase. Trained by Colin Tizzard, the seven-year-old son of Flemensfirth travelled with menace throughout the three miles and one furlong contest and ran on strongly in the closing stages to come clear of his rivals in taking fashion, registering a six-length success ahead of the Paul Nicholls-trained 10/11 favourite Topofthegame, who stayed on to finish second. Lostintranslation was second in the G1 JLT Novices' Chase at the Cheltenham Festival over two miles and five furlongs and relished today's step up in trip. Power captured yesterday's G1 Betway Aintree Hurdle aboard Jessica Harrington's Supasundae and he was delighted to record another big-race success at Aintree. He said:"I love Lostintranslation. All season he has done nothing wrong and kept the best of company. "We probably should have run in the RSA at Cheltenham, though I think for the horse's future [the JLT Novices' Chase] was the right race to run in. "We have come here over three miles and he has never come off the bridle. I had so much horse underneath me. "I said to Colin and Joe going out that I was not going to be in front too soon because he is the quickest horse in the race. "I am so happy for the horse winning a G1 because he deserves it. He is such a good jumper and a joy to ride. "Potentially, he could be [a Gold Cup horse]. He is a very good horse. The late William Codd produced him and did a fantastic job." Lostintranslation earned a quote of 14/1 for the 2020 G1 Magners Cheltenham Gold Cup with William Hill. He is also a 12/1 shot for this year's G1 King George VI Chase at Kempton Park with the same firm. Topofthegame, the G1 RSA Chase winner at the Cheltenham Festival and the 10/11 favourite for the G1 Betway Mildmay Novices' Chase today, could only finish second, six lengths behind the winner, Lostintranslation (Colin Tizzard/Robbie Power). The Paul Nicholls-trained Topofthegame was ridden by Harry Cobden, who said: "He's run a lovely race. Cheltenham may have taken its toll on him a little bit, but he's run well and galloped right to the line." Seven-year-old Topofthegame, a son of Flemensfirth, is owned by Chris Giles and Mr and Mrs Paul Barber, and Paul Barber said: "He was never travelling quite as well as he might have been. Paul [Nicholls] said he could have been a bit closer, but we don't really know. There wasn't quite the sparkle there. "There are a few horses here this week who look as though they had a hard race at Cheltenham, and that might be it." Yorkshire trainer Philip Kirby has never had a runner in the Randox Health Grand National, but he might be three-handed next year. He makes his debut with Don Poli tomorrow, and in 2020 he could be back with that horse, plus Blaklion, who he hoped to run before an injury intervened, and Top Ville Ben, who today finished third in the G1 Betway Mildmay Novices' Chase. Shaun Quinlan attempted to make all the running on Top Ville Ben, who surrendered the lead to eventual winner Lostintranslation (3/1) running to the final fence, and was then passed by Topofthegame (10/11f) on the run-in. Kirby said: "He didn't have to make the running, but nothing else wanted to and we knew there was no point sitting in behind them trying to be clever. It's a bit disappointing to be beaten, but he's run really well. "I think he's a National horse for next year - that's been the plan from five runs ago. He's rated 147 now and you need a mark like that to be sure of a run in the National. He jumps well and is the right type. "Hopefully we can come back here next year with three National runners. "We went through today's race and realised we were going to have to make the running, and that's the way he's been winning races. It's hard to make it in Grade Ones, but he's a proper horse, and more rain would have maybe helped him because the others would have struggled to close on him if it had been softer. "He used to be a mad runaway, and now he's a horse you can ride on the end of the bridle, which is a massive change. We're going the right way. "Jenny Durrans, who is leading him up, rides him every day and has turned him inside out. We've just taken our time with him and he's come right."